KANSAS CITY, Mo. The Kansas City Royals have acquired starting pitchers James Shields and Wade Davis from the Tampa Bay Rays for outfielder Wil Myers and a package of minor league prospects. The blockbuster deal announced late Sunday night is the Royals' most aggressive move yet under general manager Dayton Moore to shore up a starting rotation that has been abysmal for years. But doing so came at the cost of Myers, the minor leagues' top player last season, and a couple more top prospects. The Rays also are getting right-hander Jake Odorizzi, who would have competed for a spot in the Royals' rotation this season, along with left-hander Mike Montgomery and third baseman Patrick Leonard. Kansas City also will receive a player to be named or cash. 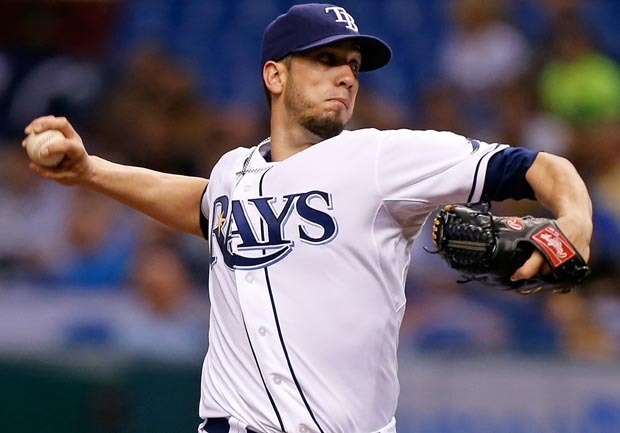 Shields, 30, was 15-10 with a 3.52 ERA, 1.17 WHIP and 223 strikeouts in 227 2/3 innings pitched last season for the Rays. He is only one year removed from finishing third in AL Cy Young voting, as he had a huge 2011 campaign, notes CBSSports.com's Matt Snyder. Myers, 21, hit .314/.387/.600 with 37 homers, 109 RBI and 98 runs in 134 minor-league games last season (35 in Double-A, 99 in Triple-A), Snyder reports. He was Baseball America's minor league player of the year.